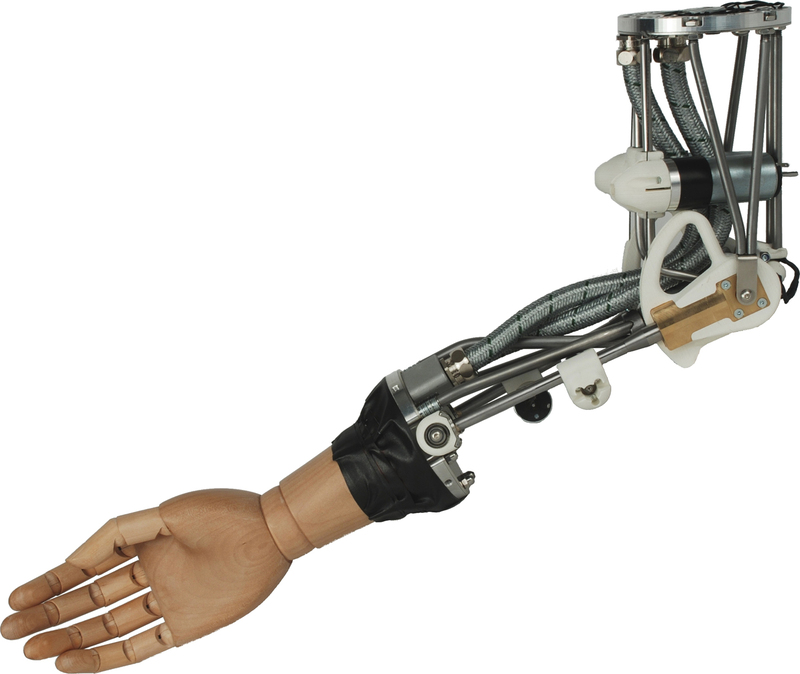 Model Smart Motor Hand (C6M) uses Shadow's electric �Smart Motor� actuation system, rather than the pneumatic Air Muscle actuation system of other Dextrous Hand systems. The Hand is driven by 20 Smart Motor units mounted below the wrist which provide compliant movements. Following the biologically-inspired design principle, a pair of tendons couple each Smart Motor to the corresponding joint of the Hand. Integrated electronics in the Smart Motor unit drives a high efficiency rare-earth motor,and also manages corresponding tendon force sensors. 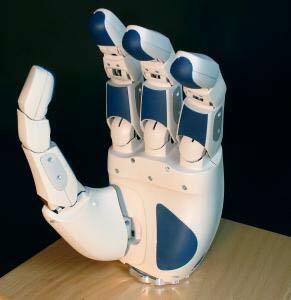 The Hand system (hand, sensors, and all motors) has a total weight of 4 kg. 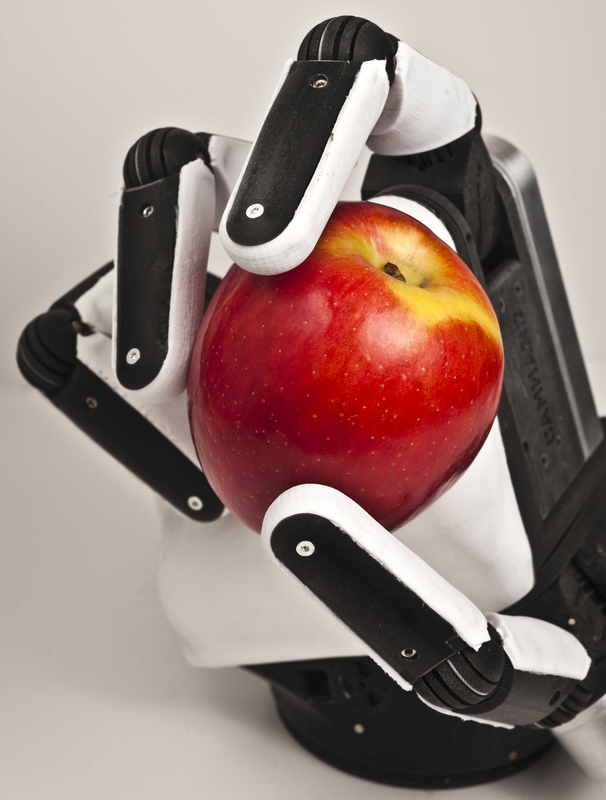 The EH1 Milano Hand is a programmable anthropomorphic human-sized hand able to grasp a variety of objects and to sense them through multiple force and position sensors. Modular actuation units are placed in flanges customized for the application, and cable transmission allows for remote actuation, thus enabling the employment of low payload robotic arms. The hand alone weighs just 250g. Each actuator contains a CPU, firmware, sensor acquisition electronics, communication electronics, servo-controllers, and one brushed DC motor. 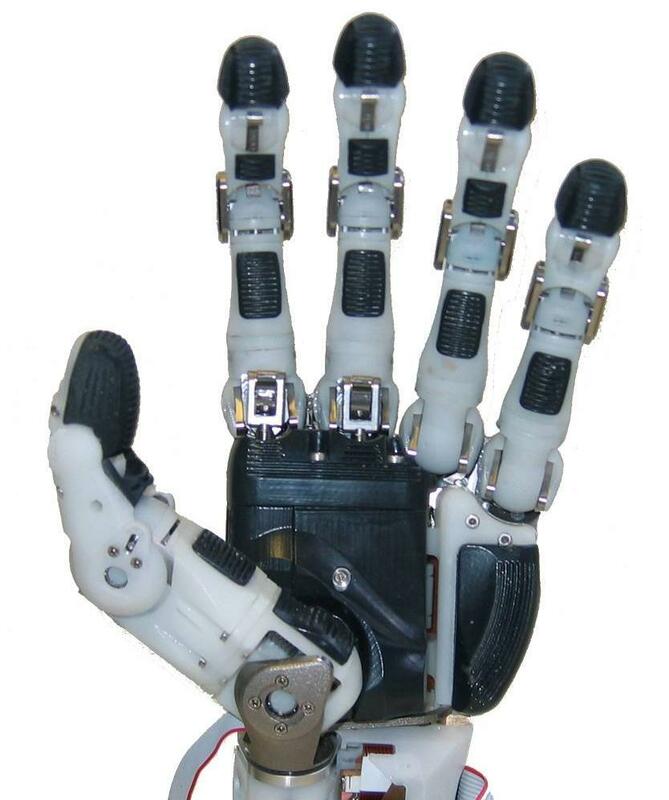 The hand communicates through RS232 or USB and is ready to be easily integrated with your application within multiple research scenarios ranging from prosthetics, neuroscience, human-robot interaction, rehabilitation, etc.. The EH1 Milano series firmware routines allow to perform grasps automatically, by just sending a single byte from your application. Alternatively advanced users may implement completely customized control schemes, taking advantage of the embedded 1 kHz servo-control loops. 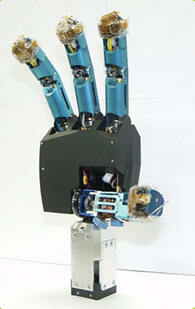 The Elu2-Hand is a human-scale anthropomorphic robot hand able to approximate real hand movements at humanlike speeds. 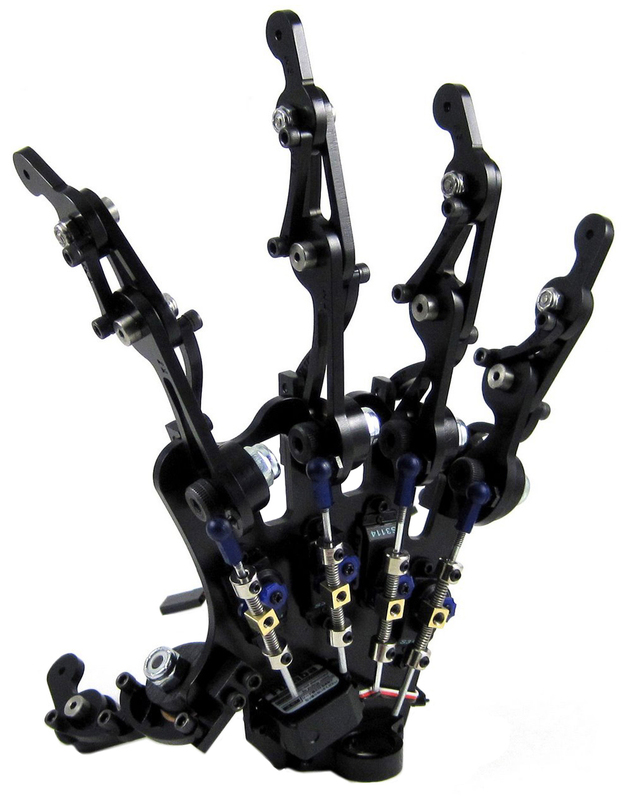 The Elu2-Hand has 9 DOFs that are servo actuated within the hand�s volume. Whilst originally designed to fit onto the Elu2-Arm the compact Elu2-Hand design means it may be fitted onto many different robot arms. The Elu2-Hand hand has large soft pad areas that aid the hand manipulate objects and provide the potential for tactile sensing. Each degree of freedom has the potential for ultra reliable non-contact absolute sensing and limit switches providing extra positioning redundancy for safety critical applications. The DLR Light Weight Robot (LWR) is a light-weight, flexible, revolute joint robot, which by its overall sensoric equipment is especially dedicated for work in the sensitive area of human interaction. The arm kinematics, size, power and manipulation capabilities are fairly similar to that of a human arm. 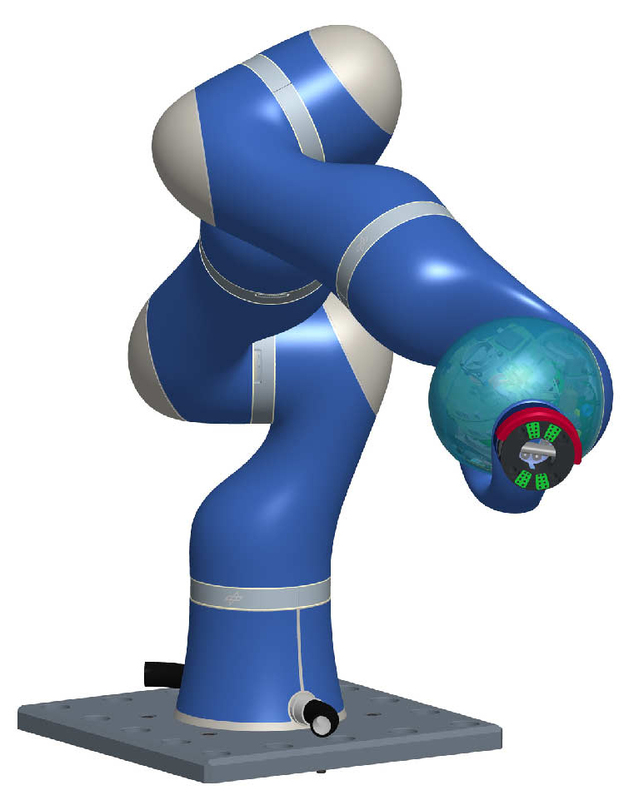 The arm can be connected to any gripper or tool by a standard robot interface flange, which can also be operated over internal supply lines. The complete electronics, including the power converters, is integrated in the arm. Each joint is equipped with a motor position sensor, a joint position sensor and a joint torque sensor. The advanced control algorithms enable vibration-free and high-dynamic movements. In this context the first roll-pitch-roll combination can be seen as shoulder and upper arm, followed by pitch-roll for the elbow and forearm and concluded by a pitch-pitch combination with kardanic as a wrist. Total weight of the arm is 14 kg, maximum payload 14 kg . 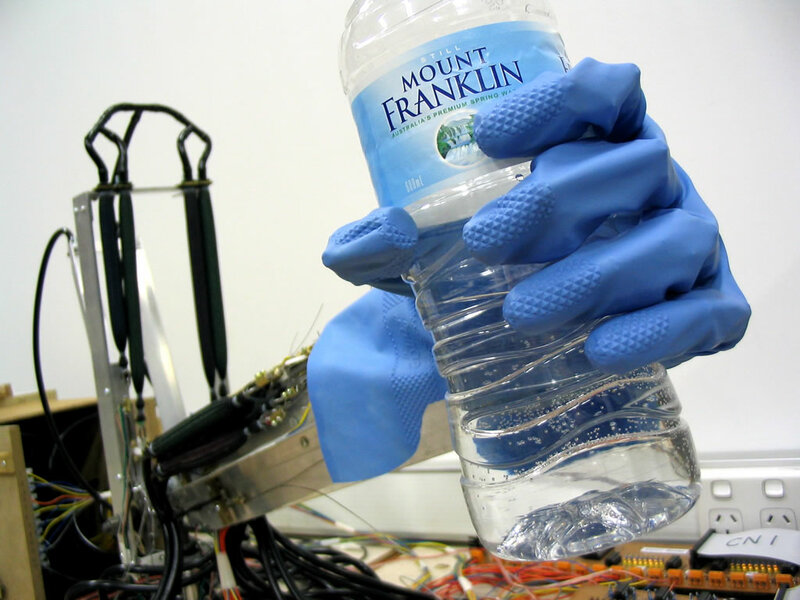 The Meka H2 Compliant Hand is a fully-contained five degree-of-freedom humanoid hand. It has a total of 12 DOF controlled by 5 actuators. This also allows each finger to automatically adapt its shape to an object, thereby increasing the grasp contact area and stability. 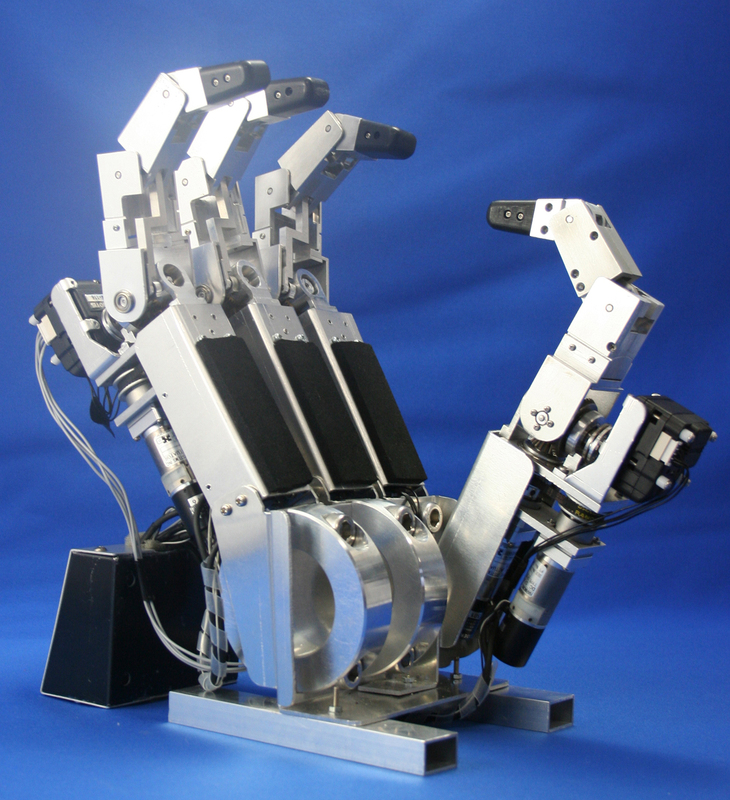 The MechaTE hand was developed to provide a robust mechanical hand platform for any number of applications. 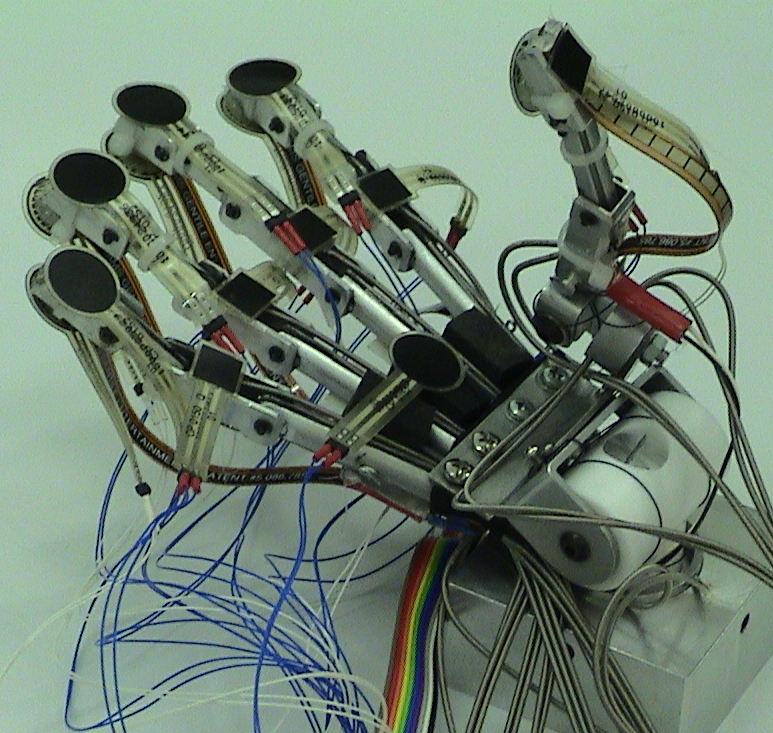 The design allows for the programmer to animate this hand quickly (only 5 servos to manage) while giving optimal realistic motion through 14 joints. The sensitivity of the finger compliance can be adjusted by the user. 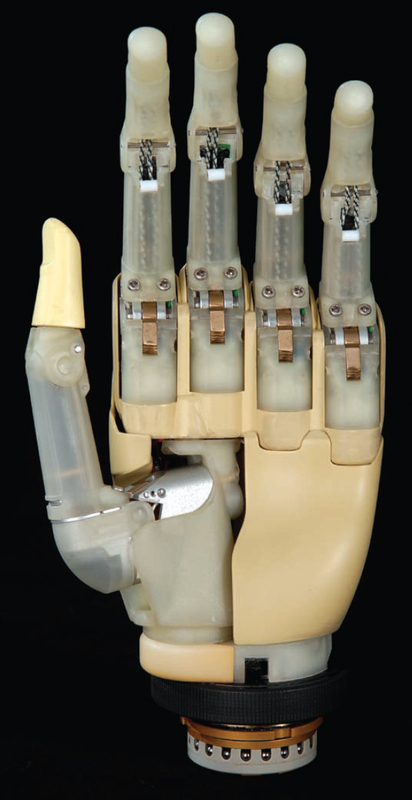 A standardized �� wrist socket at the back of this hand allows for easy connection to an existing robotic figure. 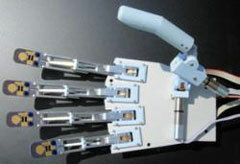 The dexterous anthropomorphic robotic typing hand (DART) was developed by a team at Virginia Tech. 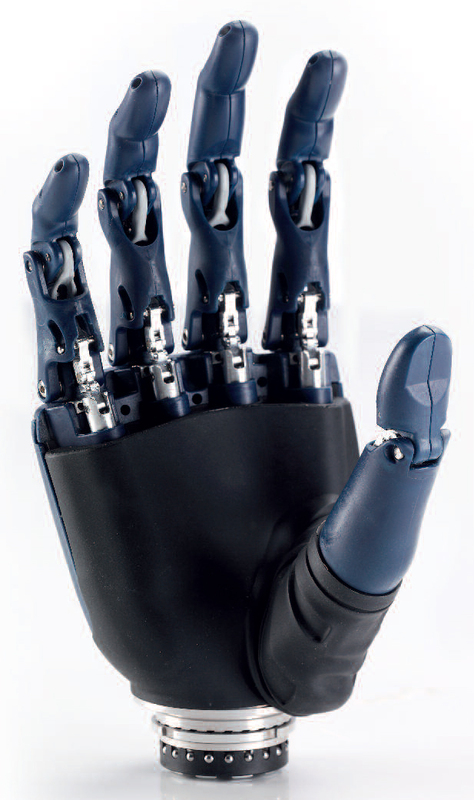 The hand is optimized to be near-human in appearance and performance and capable of many precision tasks, but the team concentrated its biomimetic design on the ability to use a computer keyboard. 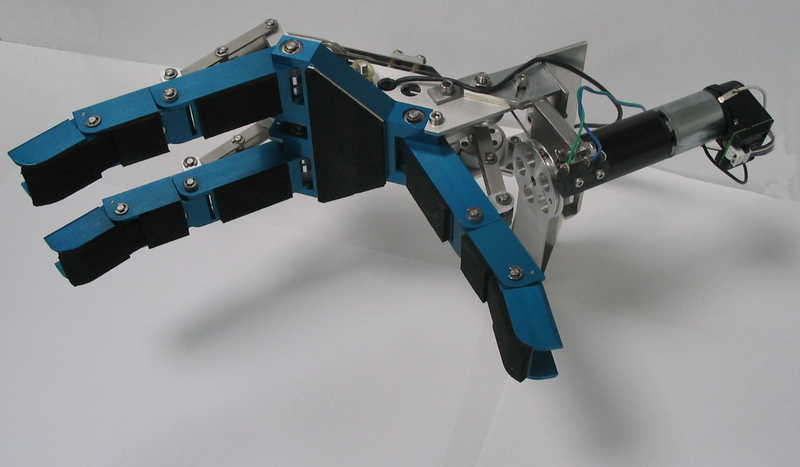 The DART hand encompassed a total of 19 motors and achieved 19 degrees of freedom. 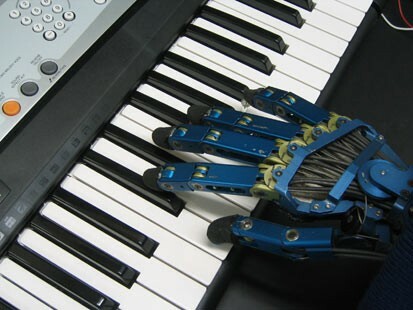 The hand can be controlled by input text, which comes from either a keyboard or a voice recognition program. When typing, a finger receives a command to position itself above the correct letter on the keyboard. 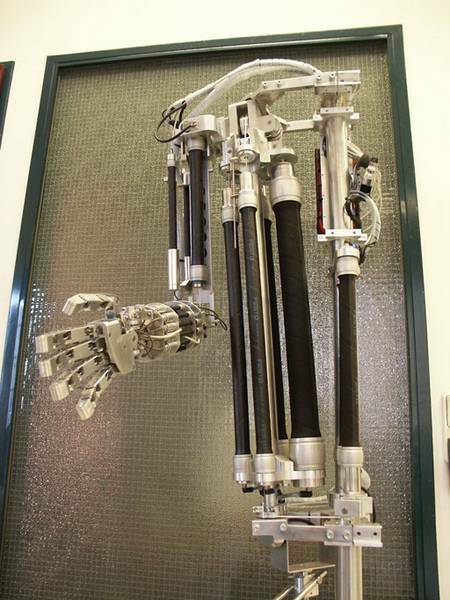 MAC-HAND is a four fingered anthropomorphic robot hand. 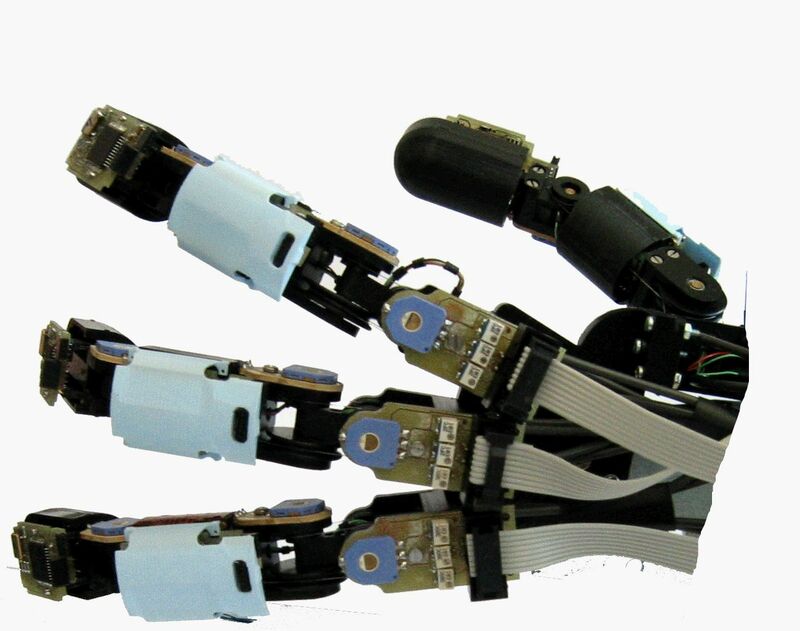 Each finger has three DOFs and is actuated by four independent tendons driven by DC motors. The four fingers are identical, and consist of two phalanges. 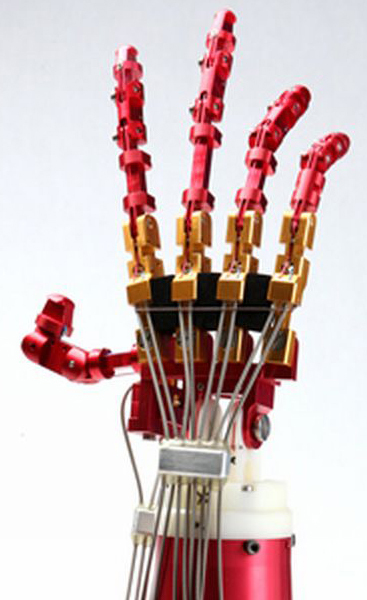 Each finger is independently actuated by four motors. The control is performed by four microcontrollers, one for each finger, Finally the coordinated control of the hand is demanded to a supervision computer connected through a CAN bus link. Finger length from tip of finger to middle of knuckle 100mm; Thumb length 102mm; Palm length from middle knuckle to wrist axis 99mm; Palm thickness 22mm; Palm width 84mm; Thumb base thickness 34mm; Forearm base to wrist axis 434mm; Weight The Hand, sensors, muscles and valve manifold have a combined weight of 3.9 kg. 4 fingers - 1 DOF each (1 servo - open/close ), 1 thumb - 2 DOF (2 servos - open/close & side to side), Fingers - 1 DOF (1 servo - spreading/closing ), Wrist - 1 DOF (1 servo - rotation), Forearm - 1 DOF (1 servo - rotation), Elbow - 1 DOF (1 servo - bend/straighten), Upper arm - 1 DOF (1 servo - rotation), Shoulder - 2 DOF (2 servos - raise/lower arm & swing forward/back), Kit includes 2 Mini-SSC servo controllers. 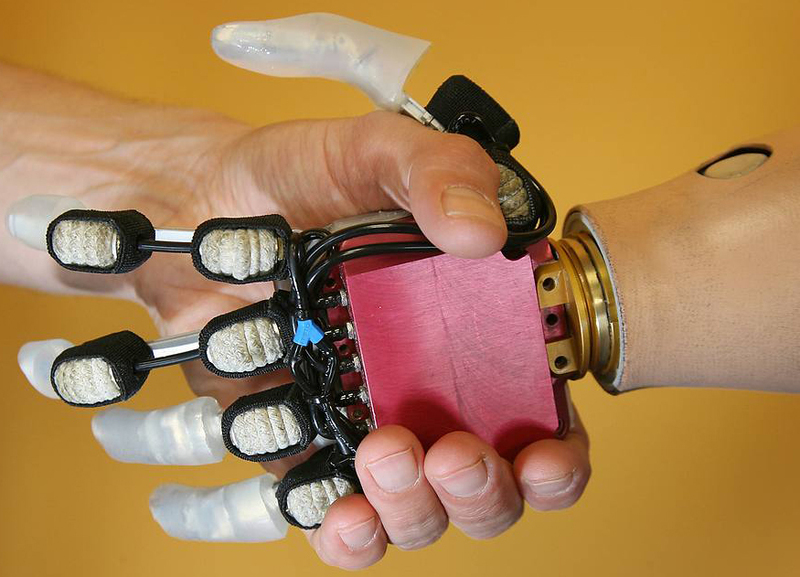 The Bionic Hand has an endo-skeletal structure and obtains cutaneous sense from a modified version of the artificial sensitive skin. 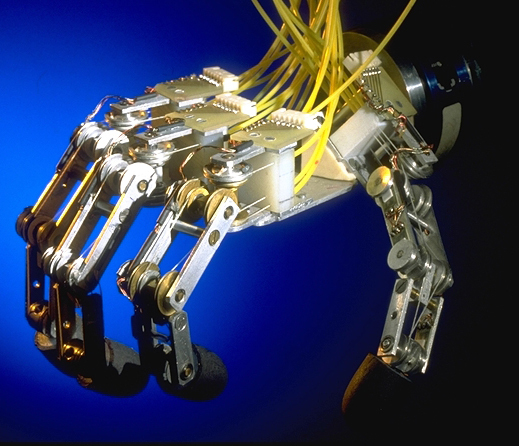 The hand has 16 DOFs with the distal and proximal interphalangeal joints actuated with the same actuators. The underactuated digits adapt to object shape by bending the joints from the proximal until the phalanges hit the object. The digits are aligned with the corpus plate so that the fingertips will come together when the hand is closed. 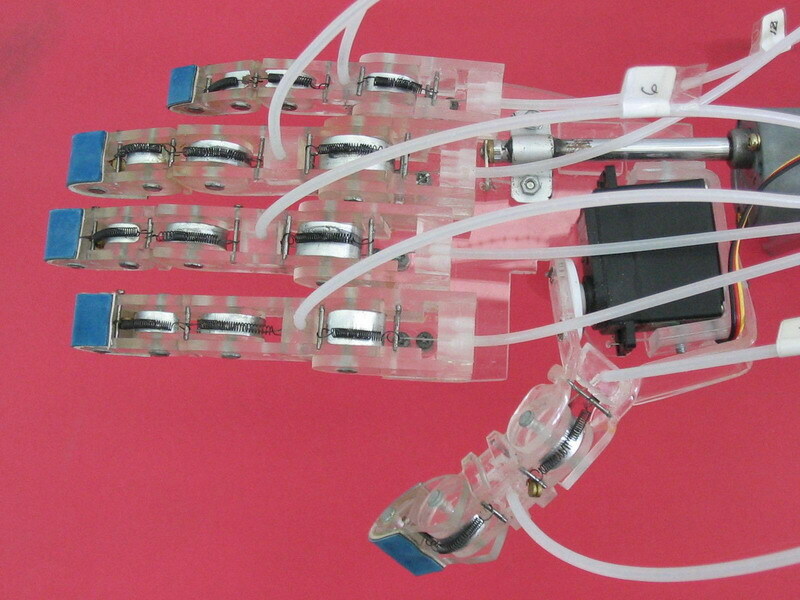 The hand is driven by 22 pneumatic actuators attached antagonistically. 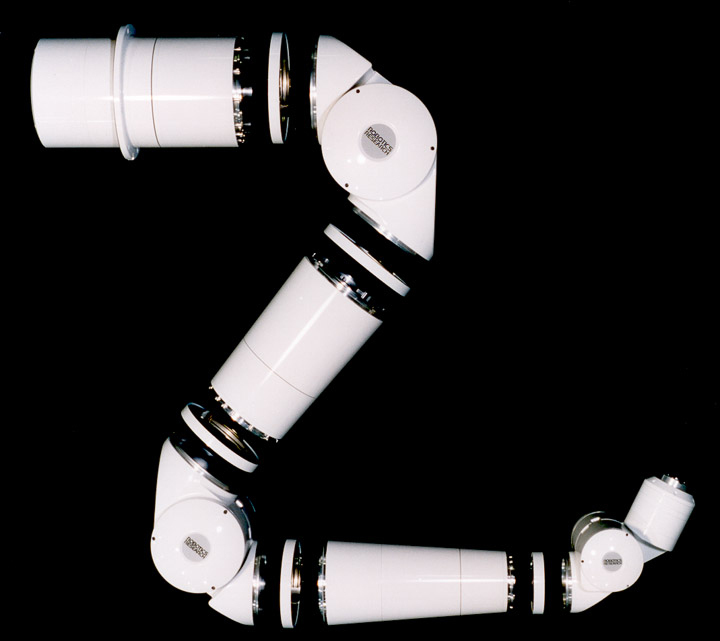 The OpenArm v.2.0 is a low-cost, 7-degree-of-freedom robotic arm. 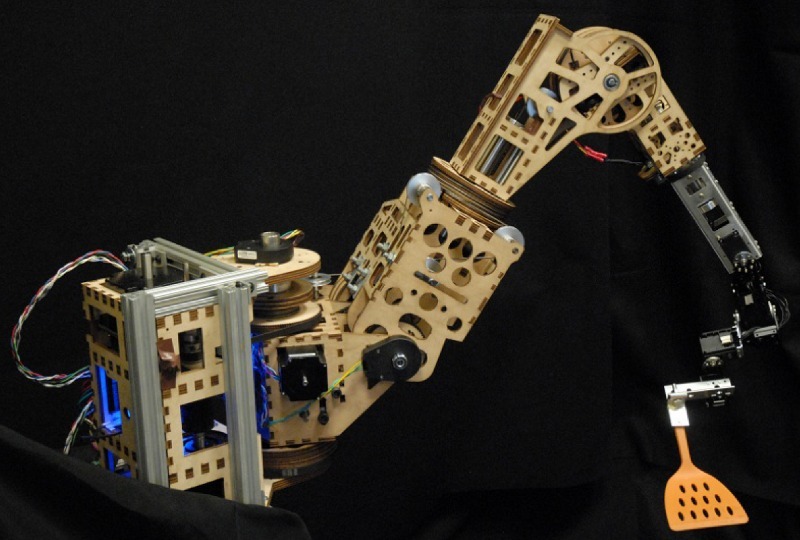 The arm is made from lasercut plywood, and is powered by four stepper motors in the base and three small dynamixel servo motors in the lower arm. It is series-elastic so it is compliant if you push on it. This is done via rubber tubes that get squished between two plates. The arm is also human-safe because it is pretty light, in addition to the compliance. The teleoperation control scheme is done using a shirt with sensors in it (accelerometers and magnetometers) that detect the wearer's pose. The computer the solves for the location of the wearer's hand, and inverse kinematics are used to get the robot's gripper to track that location. The robot is running the Robot Operating System (ROS). Gifu hand form is approximate for the human hand to not only size but also motor function like geometrically in order to realize grasp and operation of the object by changing human. The index is 5, and joint number and degree of freedom equal to the human finger joint have been established. The thumb has 4 degrees of freedom 4 joints. Intelligent Robotics & Mechanic System Lab. 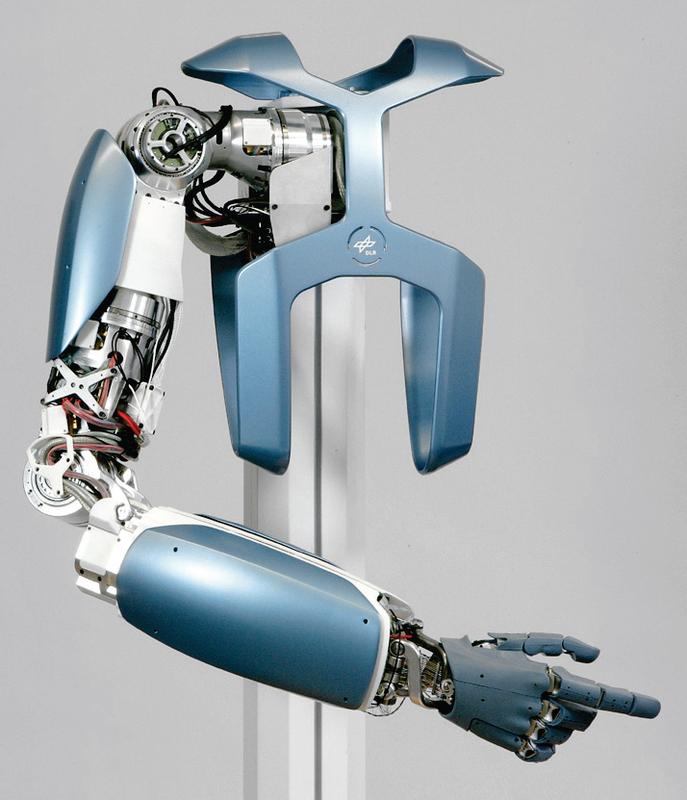 The IH1 Azzurra Hand is a human-sized programmable anthropomorphic hand able to grasp a variety of objects and to sense them through multiple force and position sensors. The hand is totally self-contained, and weighing less than 600g. It contains a CPU, firmware, sensor acquisition electronics, communication electronics, servo-controllers, and 4 brushed DC motors. Communicating through a standard interface (RS232 or USB), the hand is ready to be easily integrated with your application within multiple research scenarios ranging from prosthetics, neuroscience, human-robot interaction, rehabilitation, etc.. The IH1 Azzurra firmware routines allow to perform grasps automatically, by just sending a single byte from your application. Alternatively advanced users may implement completely customized control schemes, taking advantage of the embedded 1 kHz servo-control loops. 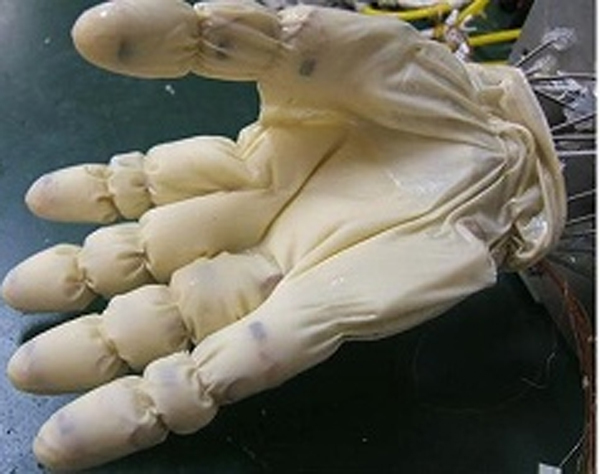 The hand is roughly the same size as an adult�s, its five fingers attached to 38 wires made of Dyneema (a super strong synthetic fiber), and individually actuated by motors hidden in the forearm. All those tendons equate to 19 degrees of freedom, closely matching a real human hand, and their stiffness can be relaxed and intensified to absorb impacts. This highly integrated mechatronic system consists of 52 drives and more than 100 sensors. 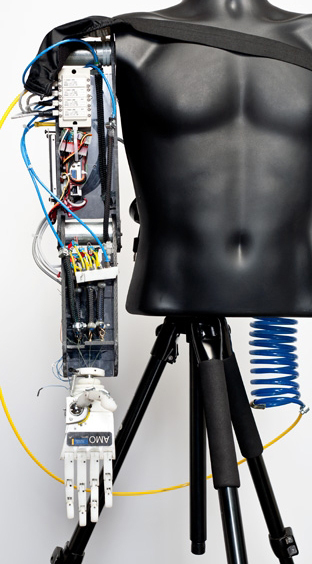 The Elu2-Arm is a human-scale anthropomorphic robot arm that simulates the movement and speed of a human arm. 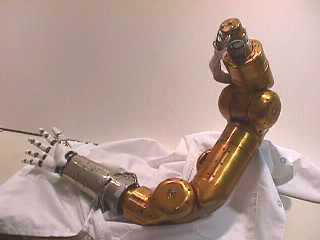 The arm has been specifically designed to support experiments investigating human-robot cooperation. Humanlike form and movement are important whilst data from the sensors within the arm may provide the researcher rich information about the dynamics of interaction. 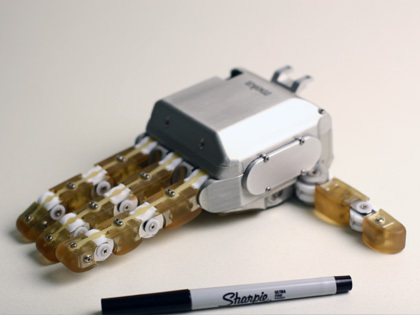 The arm has 7 DOFs actuated using powerful servo-motors and drive electronics, along with torque and absolute position sensors that are all situated compactly within the arm�s volume. 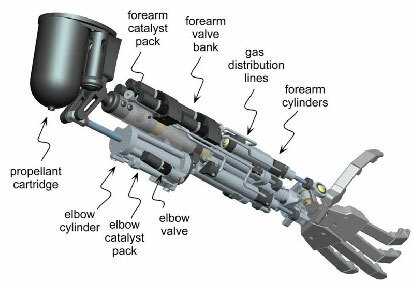 Each arm is wired with a single CAN bus for operation of the joints and to monitor the sensors. 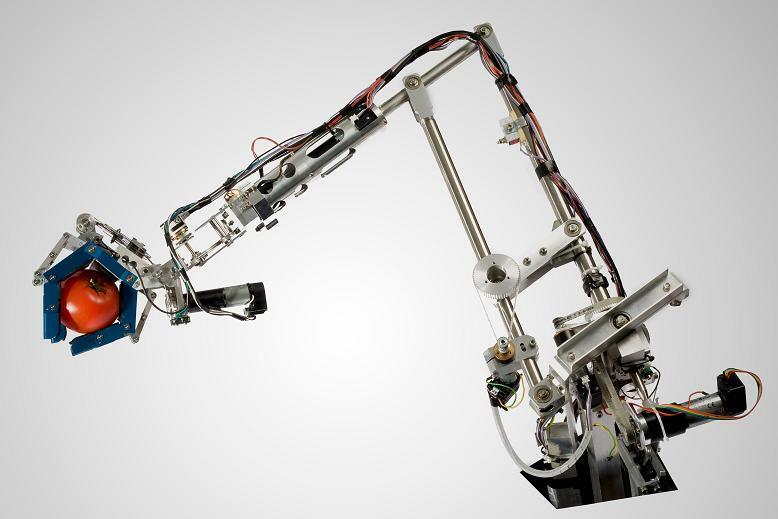 The Elu2-Arm is designed to work with the Elu2-Hand, however, the arm has been fitted with novel end-effectors, such as novel sensors, custom grippers or surveillance equipment. Due to its versatility the hand may be used in many applications ranging from teleoperation to promotion and entertainment. The new modular robotic arms include modular servo-actuators. These actuators are composed of a motor-gearbox, a power stage and a controller, so the resulting arm does not need an external control unit. Thus, the communications between the arm and the external environment are reduced to the minimum wires: 2 for CAN bus and 2 for power. The arm can be adjusted to the needed application requirements, so it is possible to choose a conventional arm or to redesign the joining elements to fulfill the specific application needs. This type of arm integrates the power and control stages and is the most suitable for installations over mobile platforms or androids. Jaco Arm enables users to interact with their environment with complete safety, freedom, and effectiveness. The arm moves smoothly and silently around 6 degrees of freedom with unlimited rotation on each axis. The axes are aluminum compact actuator discs (CADs) of a unique design. Each arm consists of 2 distinct sets of 3 identical, interchangeable, and easy-to-replace CADs linked together by a zero insertion force cable. Its main structure, entirely made of carbon fibre, delivers optimal robustness and durability as well as a cutting-edge look-and-feel. The arm is mounted on a standard aluminum extruded support structure that can be affixed to almost any surface. 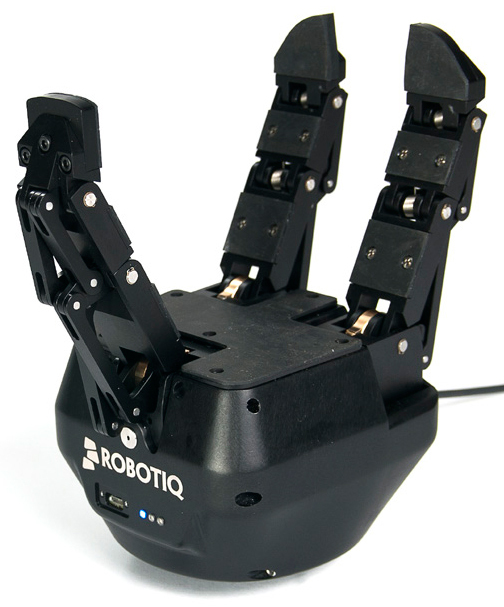 Adaptive Gripper is developed by Quebec company Robotiq. 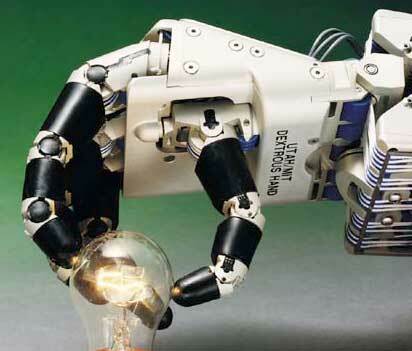 It is a very interesting robotic gripper that can adapt to various types of objects. The gripper has 3 articulated fingers and 4 grasping modes to pick a wide variety of sizes and shapes, send simple open-close commands and let the gripper adapts to any geometry, control the closing speed, force, do partial closing / opening, receive grip detection feedback from the gripper. Embedded gripper controller communicating with the robot controller over Ethernet/IP, Modbus RTU, DeviceNet or EtherCAT. The gripper comes with the mechanical mount for any robot, and equipped with two connectors on the side for 24V power supply and communication. 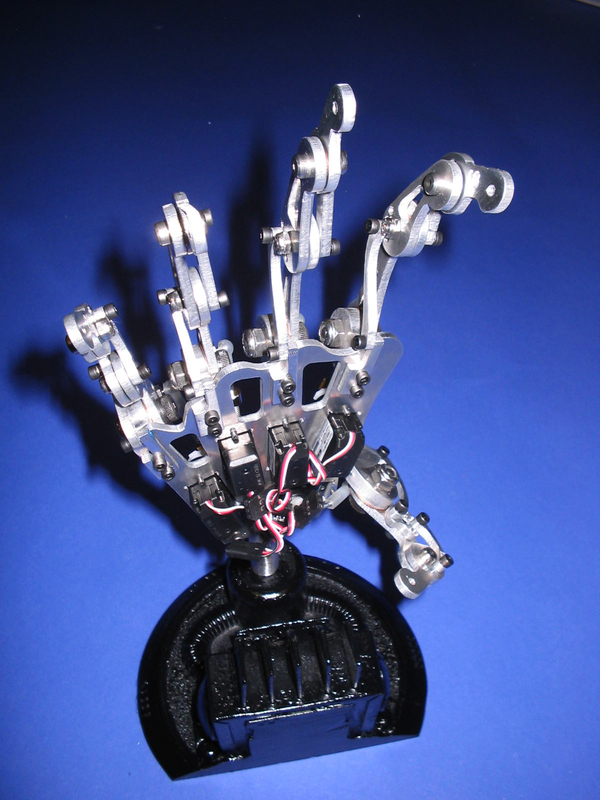 The DIST-Hand is a 4 fingered mechanism with 16 degrees of freedom (4 DOFs on finger) and with a high degree of dexterity. It is a small and lightweight dexterous gripper with anthropomorphic kinematics, which could be easily installed even on small robot manipulators. Each joint has a range of rotation larger than 90 deg, and equivalent to that of a human hand; each finger is actuated through 6 polyester tendons, routed through pulleys and driven by 5 DC motors. To implement servo loops around the perturbations due to the elasticity and in part to friction, on each joint mounted hoc rotation sensors. General weigh of the hand less than 1 kg. 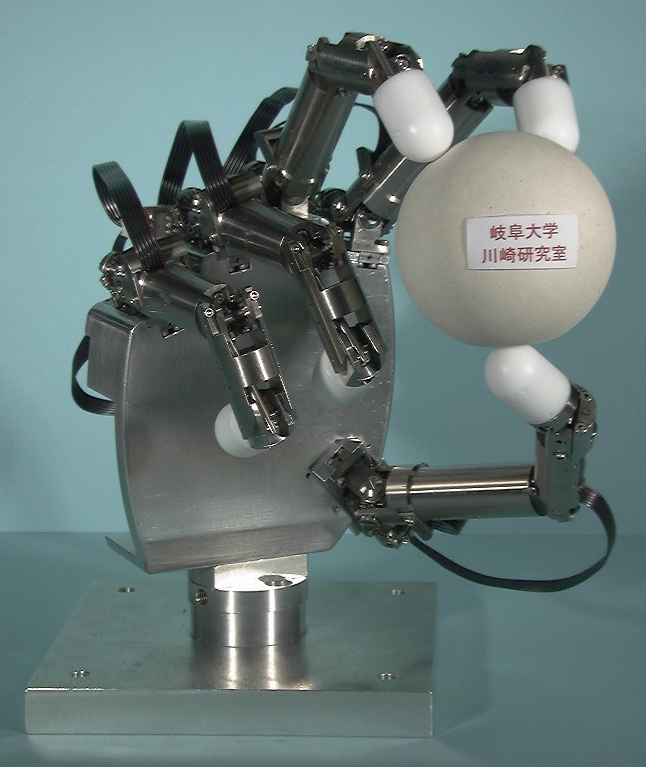 The anthropomorphic robot hand called OCU-Hand (Osaka-City-University-Hand) has the human-like size, weight and performance with the prime objective of grasping different shapes firmly. 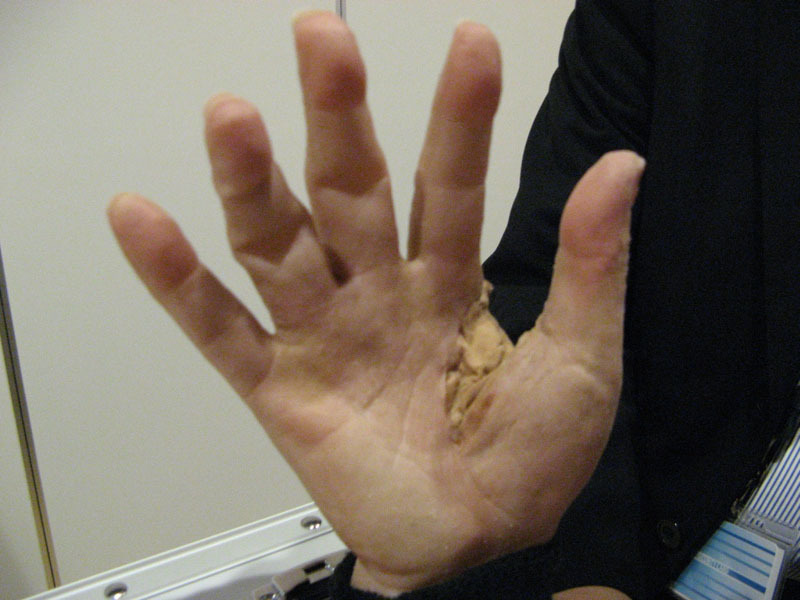 The hand is composed of five fingers with total 15 DOFs. In addition, 3 DOF are given for a dexterous designed wrist. 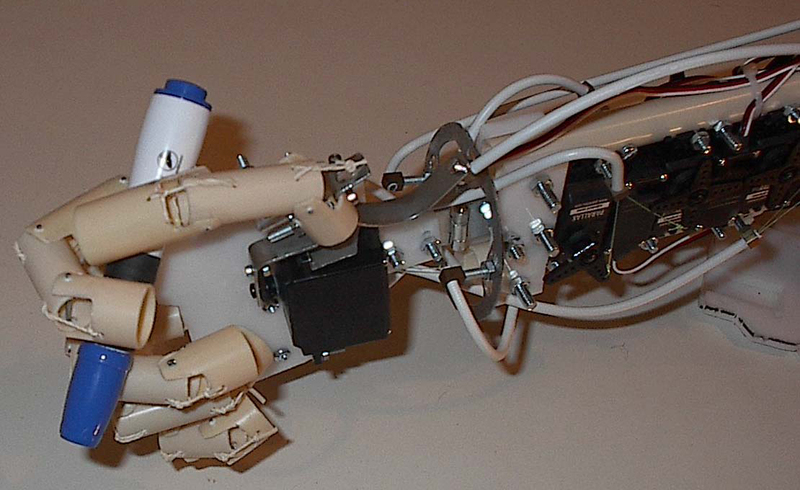 All the joints of the OCU-Hand are driven by servomotors built into the fingers. The thumb finger in our proposed hand has a special design that improves the implementation of the hand, and the palm has a unique design so as to improve the hand grasping and handling of different shape objects. Distributed tactile and force sensors are appended to the OCU-Hand as a feedback system in order to grasp an object firmly. A master light-weight glove is to be used to drive the OCU-Hand as a slave. The Modular Prosthetic Limb (MPL) was developed as part of a four-year program by the Johns Hopkins Applied Physics Laboratory and was used by wounded warriors at the Walter Reed National Military Medical Center for the first time Jan. 24, 2012. The upper arm contains a shoulder with two drives (abduction/adduction and flex/extend), a humeral rotator, an elbow, and the power unit. Depending on the amputation level of a particular patient, all of the joints or a subset can be used. 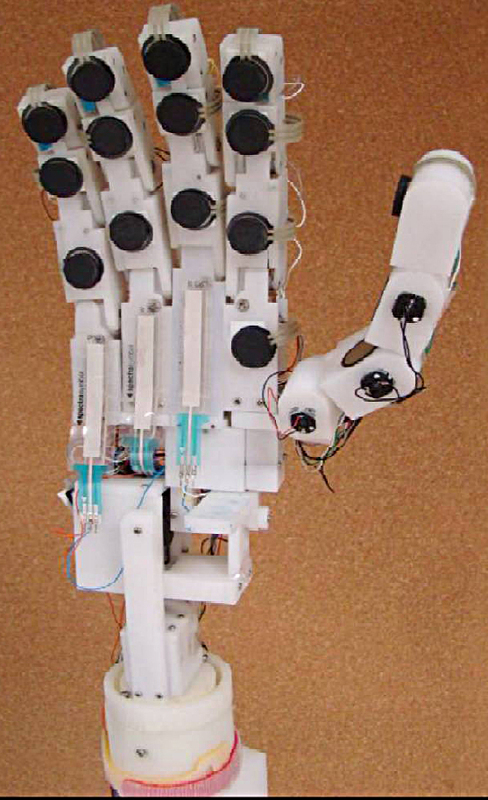 The thumb, fingers, and finger abduction/adduction drives was designed as self-contained units with embedded motor controllers containing low-level position and velocity control algorithms with dedicated electrical connections to the palm. 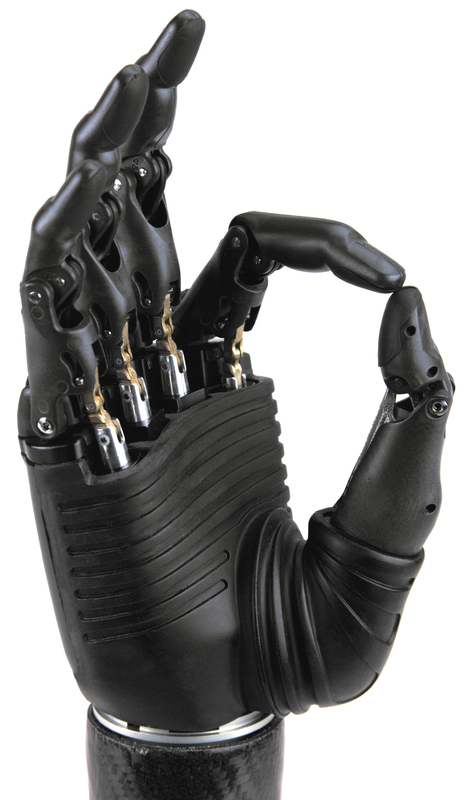 The palm contains mechanical attachment points and electrical connectors for all four fingers, the thumb, the finger abduction/adduction units, and the wrist. The i-LIMB Hand is controlled by a highly intuitive control system that uses a traditional two-input myoelectric (muscle signal) to open and close the hand�s life-like fingers. Myoelectric controls utilize the electrical signal generated by the muscles in the remaining portion of the patient�s limb. This signal is picked up by electrodes that sit on the surface of the skin. Existing users of basic myoelectric prosthetic hands are able to quickly adapt to the system and can master the device�s new functionality within minutes. For new patients, the i-LIMB Hand offers a prosthetic solution that has never before been available. The modular construction of the i-LIMB Hand means that each individually powered finger can be quickly removed by simply removing one screw. This means that a prosthetist can easily swap out fingers that require servicing and patients can return to their everyday lives after a short clinic visit. 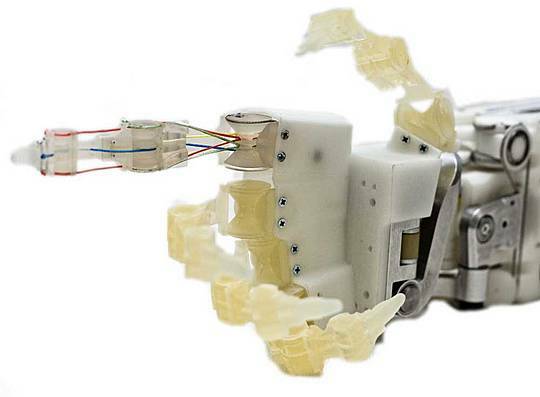 The Bebionic v2 Hand is a fully upgraded version of a Bebionic Hand. New features include upgraded individual motors for significantly higher operating speeds. To optimise the convenience of wireless programming, the radio frequency board had been redesigned and integrated within the hand and bebalance software has been simplified. On-board microprocessors constantly monitor the position of the digits to ensure that grip sequences are accurate every time, with no loss of control or need to reset. 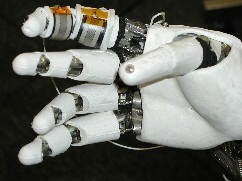 By placing the motors in the palm of the hand weight distribution in the prosthesis has been optimized. Electronics within the hand include a selectable Auto Grip feature that sense if a gripped item is slipping and automatically provide additional power to maintain a secure and safe hold. Fully proportional, speed control allows the user to master delicate tasks such as manipulating an egg or holding a filled polystyrene cup, as easily as crushing an empty soda can. Kinea invented a novel cobotic powerplant to be located in the forearm region, weighing less than two pounds, which couples artificial tendons actuating 15 hand joints to a single electro-magnetic motor via infinitely-variable rolling-contact transmissions. The 15 infinitely-variable transmissions draw power as needed for their respective hand joint from a common shaft driven by a single motor. This architecture proved more lightweight and more power and energy efficient than using 15 motors paired to 15 fixed-ratio drive trains. 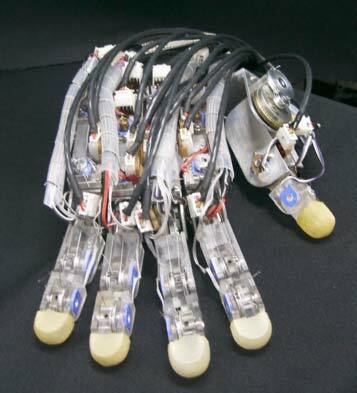 The LUCS Haptic Hand III is a five fingered 12 DOF anthropomorphic robot hand equipped with 11 proprioceptive sensors. 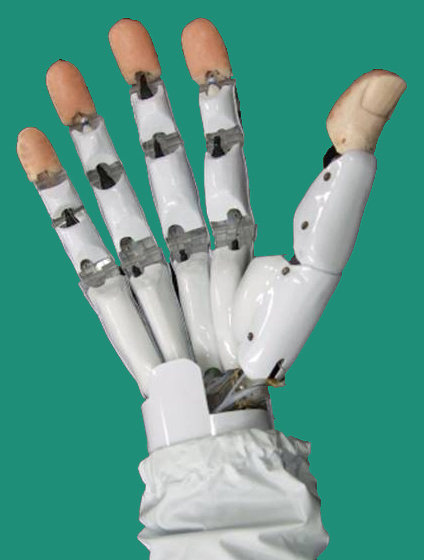 As the human hand, the robot hand has a thumb, which consists of two phalanges whereas the other fingers comprise three phalanges. Some successful haptic systems, based solely on proprioception, with capacity to recognize shape, size as well as individual objects were implemented with this robot hand together with various kinds of Self-Organizing Neural Networks. 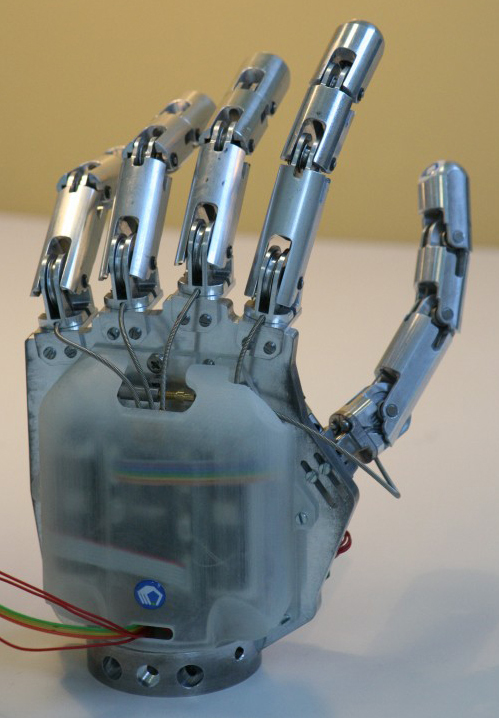 Scientists are developing a neural interface that can use signals in the brain to control fingers on a robotic hand, shown here. 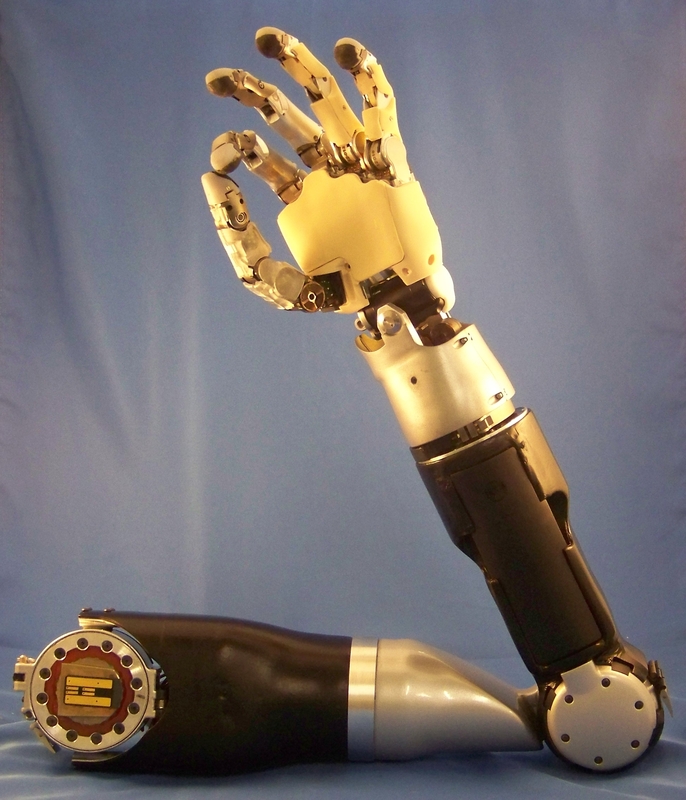 Funding the most ambitious prosthetics project ever, the U.S. military is trying to build a truly bionic arm. The project's second prototype is controlled by thought and capable of providing sensory feedback. 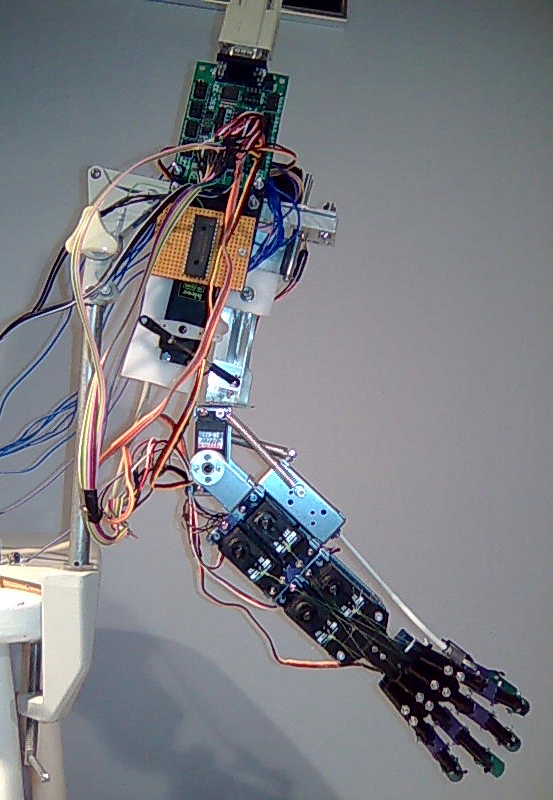 Human-like arm with a dexterous and sensitive hand, controlled by a computer program inspired by the human cerebellum. 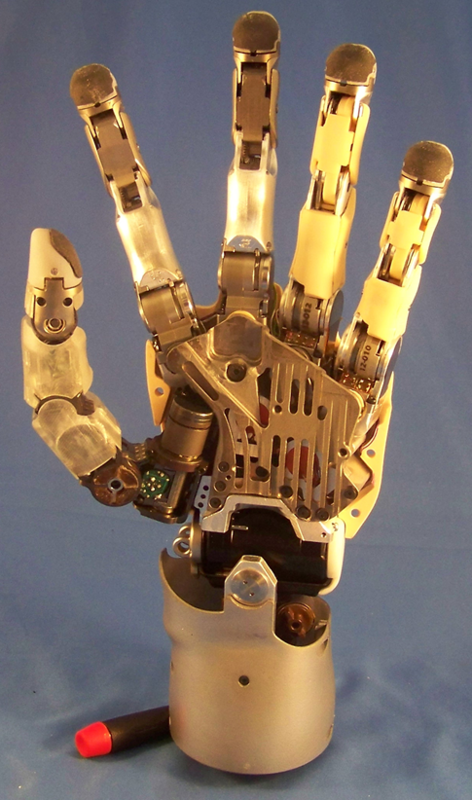 The CyberHand was designed as a prototype for testing and evaluating neural interfaces, control algorithms and sensory feedback protocols. 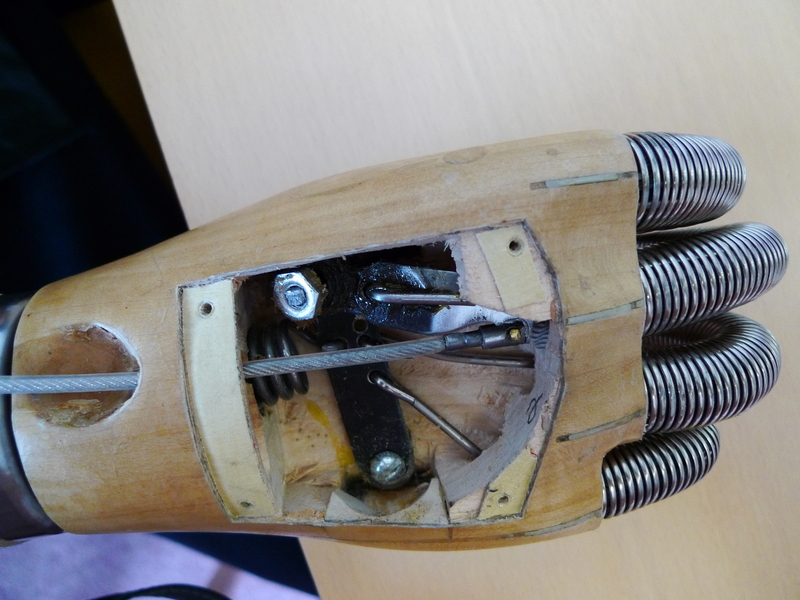 It has 16 DoFs and 6 motors (that is, 6 degrees of mobility, DoMs): each finger of the CyberHand has three DoFs and one DoM (flexion/extension) and the thumb has, in addition, 1 DoM for positioning. 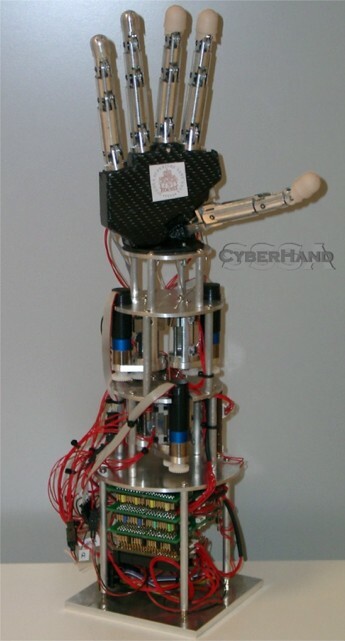 The size of the CyberHand is comparable to human hands and can generate many different grasps; its control is currently limited to a subset of functional grasps: lateral pinch, cylindrical and spherical grasps and the tripod grasp. 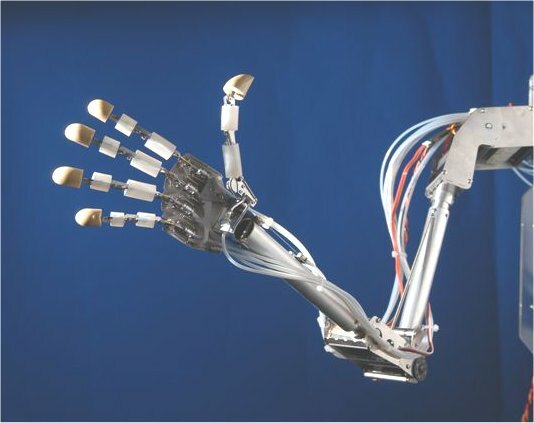 On the technological basis of the DLR Hand the German Aerospace Center (DLR) and the Harbin Institute of Technology (HIT) have jointly developed a new robot hand. 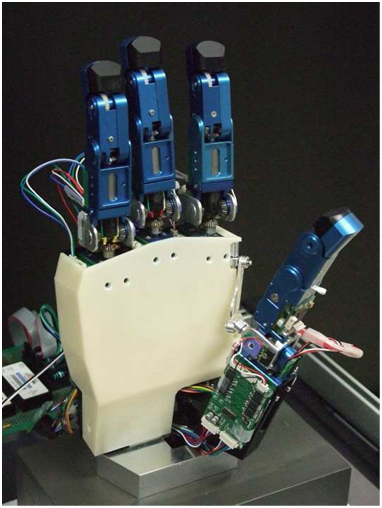 Compared to the former hands, the new hand, DLR-HIT Hand II, has five modular fingers, each finger has four joints and three degrees of freedom. Nevertheless the new hand is even smaller and lighter. 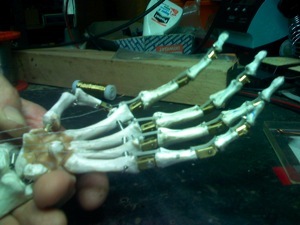 Altogether there are 15 motors inside the finger body and palm. 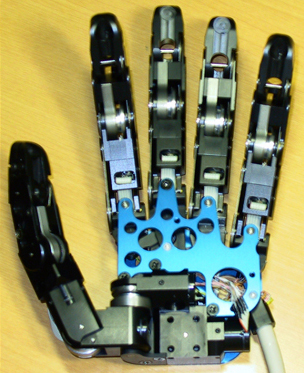 The hand is actuated by commercially available flat brushless DC motors commutated via digital hall sensors. There is an absolute angle sensor and a strain-gauge based joint torque sensor associated to each joint. The high-speed real-time communication bus is implemented by use of FPGAs. 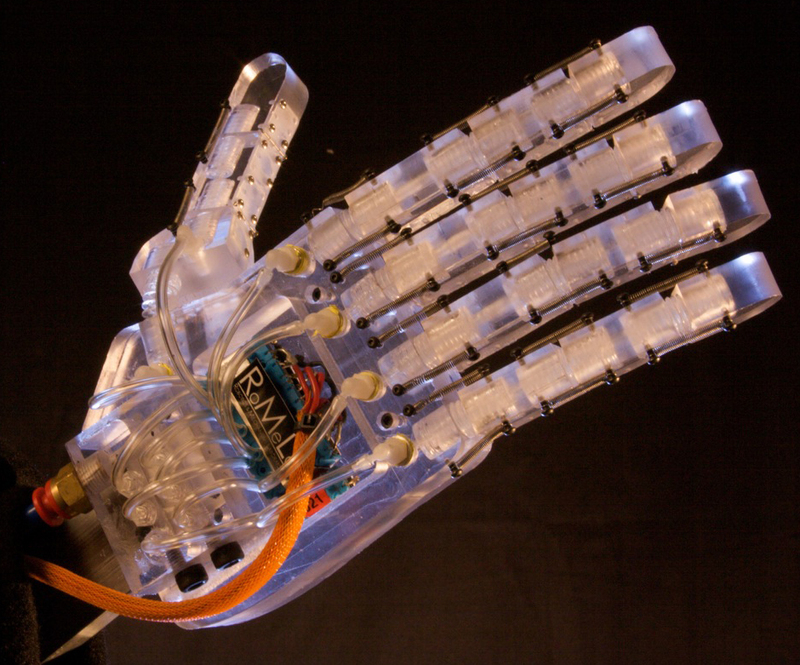 The Bebionic hand is a fully articulating myoelectric hand.controlled by muscle contraction. 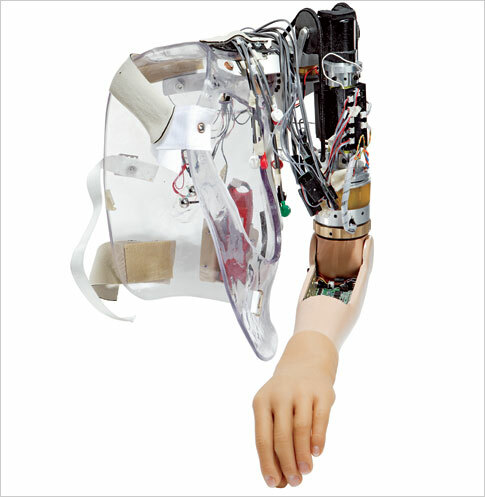 Electronics measure electrical changes on the skin covering the control muscles, and command individual actuators in the hand to provide the desired movements. With a life-like and anatomical design, the fingers move together as the hand closes so that objects such as a fork or piece of paper can be gripped naturally between the fingers.